Oivi was a small village five kilometres along the track from Gorari, towards Kokoda. After withdrawing from Gorari, where they had ambushed the advancing Japanese, Captain Sam Templeton’s two platoons and elements of the Papuan Infantry Battalion were joined by another platoon of the 39th Battalion which had recently flown into Kokoda. The Japanese attacked in the afternoon of 26 July 1942 and soon surrounded the Australian position. About 5 pm Templeton went to check the rear defences. There was a burst of fire from the gloomy jungle and Templeton did not return. Apparently he was captured and subsequently killed. Known affectionately as “Uncle Sam”, Templeton was the only officer in the 39th Battalion who had served in the First World War. 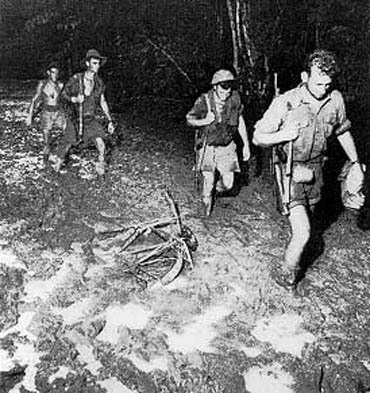 After dark the Australian and Papuans, now under Major W.T.Watson of the Papuan Infantry Battalion, broke out of the perimeter and headed towards Deniki, beyond Kokoda, as it was considered the easier route. Oivi also figured prominently during the counter offensive. 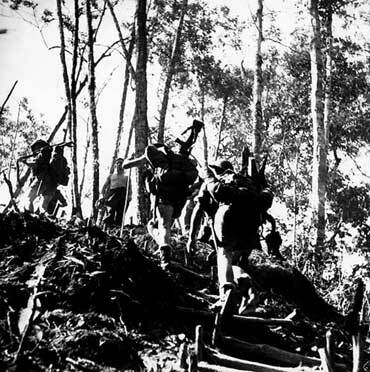 After the Australians entered Kokoda on 2 November, Brigadier Lloyd’s 16th Brigade took up the advance along the track towards Oivi with two of his battalions, the 2/2nd and 2/3rd. His 2/1st Battalion had been attached to the 25th Brigade and began a wide sweeping movement through the jungle to the south. On 5 November the 16th Brigade struck the main Japanese defences covering Oivi. Next morning the Japanese mounted a counter-attack, which was beaten off. By this stage the 16th Brigade had been reinforced by the 3rd Militia Battalion which patrolled the wide front extensively. It was clear that the Australians were facing the prospect of an expensive battle of attrition. The divisional commander, Major-General Vasey, however, had other ideas and deciding “to risk having no backstop on this front” sent the 25th Brigade to the south to cut off a possible Japanese withdrawal route. It was a successful manoeuvre, carried out with skill and enterprise. The 25th Brigade and the 2/1st Battalion fell upon the Japanese position at Gorari. Realising that their supply and withdrawal route had been cut the Japanese defenders at Oivi began to withdraw. The 16th Brigade had been spared a lengthy battle by a skilful manoeuvre. But since leaving Owers’ Corner in early October they had sustained 471 battle casualties (145 deaths). The 2/1st Battalion, for example, had begun its operations in early October with a strength of 608 all ranks and when it reached the Kumusi on 16 November was down to 355 all ranks. It had sustained 137 battle casualties; the rest were lost from sickness, but since many of the sick had rejoined the unit, the actual numbers of sick were much higher.